Can you think of a more important day than your wedding day? You cannot, because the wedding day certainly is everyone’s most cherished day – a day when one begins a new journey and when “I” becomes a “we.” Many people rightly opt this occasion as the best to hire a limousine to make a grand appearance and a memorable exit. But hiring a limousine is not about making your friends and family envious and to show off style but more to have an appropriate beginning to this new journey. The feel of sitting and having a ride in a limousine is very dreamy and has an element of fantasy; both qualities common with the wedding day. Therefore it only seems right to hire a limousine for the wedding reception. With Deol Limo, you will get additive services of decorating the limo from the inside as well as the outside. Customized decoration will give you a unique feel and is sure to give your wedding a bright start. We have a bunch of exclusive limousines to choose from especially for the wedding day; go through them to decide the one you want. It’s a good thing that we have top class different limousines available for hire. From Ford 650 to Bentley, we have everything; but the thing that matters is what you want. If you want our advice then the Hummer Limousine is certainly gaining more popularity than the others because of the many services that we are ready to offer with it. How about you arrive to your wedding reception in a grand limo and then you get out of the vehicle on a red carpet? Yes, that’s what we are talking about. We offer the red carpet service with not only the Hummer but also with the Lincoln Navigator Limousine which is fit with state-of-the-art navigation system. Besides these limousines, we also have the Rolls Royce Limousine, the Limousine Bus and the Ford Expedition Limousine. 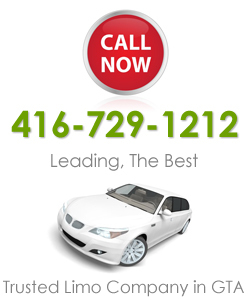 Our valued customers will be happy to know that it is not just the main city of Toronto in which we serve; in fact you can take advantage of our exclusive services in all the other small towns and cities like Oakville, Richmond Hill, Mississauga, Brampton, Woodbridge, Vaughan, Markham and many others. If you want to book a limousine with us, then do it now and don’t delay to avoid confusion and tension. Take advantage of the attractive packages and services and make your wedding day a memorable one.